With dedicated parking spaces near major entrances on each Intel campus, ReachNow's shared fleet of BMW and MINI vehicles will be easily accessible to nearly 20,000 Intel employees and contractors, adding mobility options on the west side of the metro region. 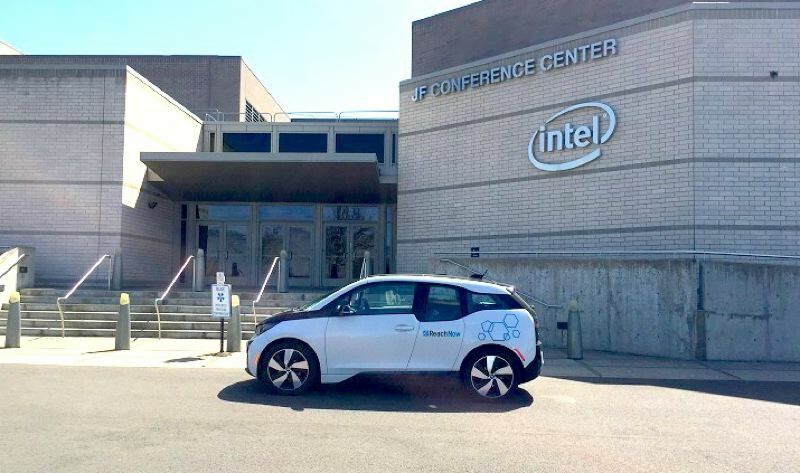 As part of an effort to improve mobility options for employees, Intel and ReachNow have announced an expansion that brings ReachNow's free-floating car sharing service to Intel's four campuses in Hillsboro. ReachNow is a short-term car rental company that is part of the BMW Group. "Portland was one of the first cities in America to embrace car sharing, but large suburban business campuses are often still relatively limited in mobility options," said Steve Banfield, CEO of ReachNow. "We believe that giving Intel employees and suburban residents more options for getting to the places they need to go will reduce traffic congestion. Access to ReachNow cars on an as-needed basis makes commuting by bike, bus, light rail and carpooling on a regular basis more viable." ReachNow currently serves about 40 square miles of the greater Portland area. The company also provides services in Seattle and New York. In November 2017, the company announced that it had expanded to the Tektronix campus in Beaverton and to Hillsboro's Orenco Station district. For more information on ReachNow, visit www.reachnow.com. The ReachNow app is available for both Apple and Android phones.